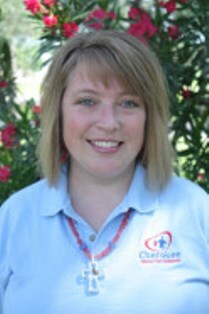 Kaci Morrison is the Administrative Assistant to the Executive Director at Cherokee Home for Children. She has worked in the office since January 2012. Kaci has lived and worked at Cherokee Home since 1998. During her time in Cherokee, she served as a houseparent, pantry manager, educational coordinator, and then math teacher for the Cherokee ISD. Kaci’s father is Danny Duggan, long-time administrator to Cherokee Home for Children. Danny lost his life in an Aggies for Christ/Cherokee Home staff basketball game in January 2011 when he fell and hit his head on the floor. Because of the love Danny had for Cherokee Home and its children, Kaci is striving to continue the work that Danny desired to do by helping to promote awareness of the children’s home and its needs to more and more churches and individuals. Kaci is married to her high school sweetheart, Tommy Morrison, also the campus director at Cherokee Home. They have been married since 1993 and have two daughters, Talli and Tori, and are in the process of adopting a son, Kaden. Kaci relies on Ephesians 3:20 in her work for Cherokee Home. “He is able to do far more than all we ask or imagine, according to His power that is at work within us.” Kaci desires to be used by God to accomplish the things He desires for Cherokee Home.